Seeking "The Spirit of Thetis"
Heat exhaustion occurs when people exert themselves in hot, humid weather and their bodies sweat excessively. This causes the body to lose fluids and becomes dehydrated. A person’s temperature may become elevated but not above 104F and they may have a rapid pulse. Without intervention, heat exhaustion can progress to the more dangerous “heat stroke”. If you suspect someone may be suffering from heat exhaustion, attempt to get them to an air conditioned place and have them drink plenty of liquids (but not alcohol or caffeinated drinks as they dehydrate). A cool shower may also be helpful. If a person’s body temperature does not lower after these measures have been taken, then seek immediate medical attention as they may be progressing to a full heat stroke. Age – Infants and children up to age 4 and adults over the age of 65 tend to be more sensitive to heat related illnesses as their bodies tend to adjust to heat more slowly than others. Medical conditions - People with diabetes, obesity, mental illness, high blood pressure, heart, kidney or lung disease may also be vulnerable to heat related illnesses. Medications - Certain medications can also make one more susceptible to heat exhaustion. These include diuretics, blood pressure medication, stimulants or tranquilizers. Heat stroke (also referred to as sun stroke) is usually caused by untreated heat exhaustion. Heat stroke occurs when the body’s cooling system, controlled by the brain, stops working and causes the body’s temperature to elevate to dangerous levels of 105F and above. When this happens other internal organs can become damaged or stop functioning causing the individual to be in a life or death situation. 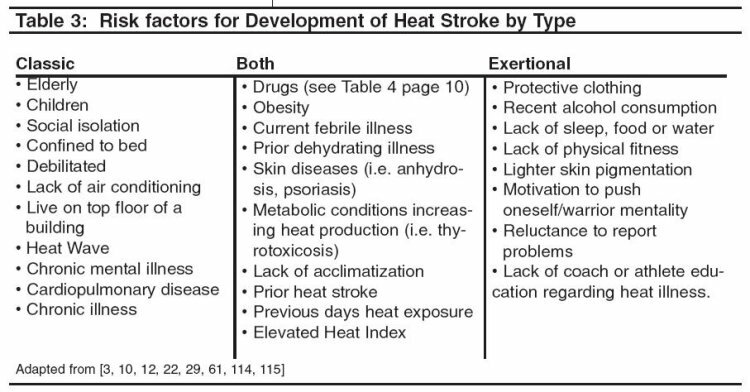 Heat stroke is not the same as stroke. The term is generally used to describe decreased oxygen flow to the brain. Those most at risk of heat stroke are as described above for heat exhaustion including athletes. Symptoms of heat stroke can sometimes mimic a heart attack. However, some may develop symptoms of heat stroke suddenly and rapidly without warning. What to Do For Heat Stroke? If you suspect someone is suffering from heat stroke, it is important to call 911 for immediate assistance. It is important that the person be rehydrated and kept cool. 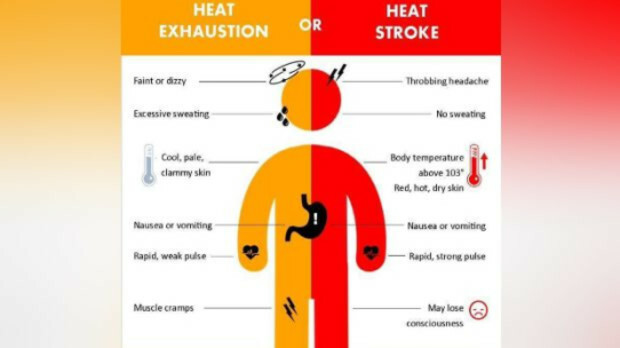 It is sometimes difficult to tell the difference between heat exhaustion vs heat stroke. If in doubt, please seek medical attention immediately. 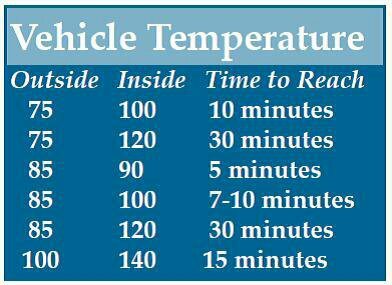 Please know that our beloved pets are also susceptible to heat strokes which is why it is so important not to leave your furry babies inside a locked car on a hot day. Knowing what to do in an emergency situation is something we should all know. I recommend taking first-aid training through St. John Ambulance. 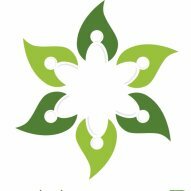 Would you like to join the Healthy Waterloo Region? We would love to hear from you. Click on the Talk to Us button below and reach out.